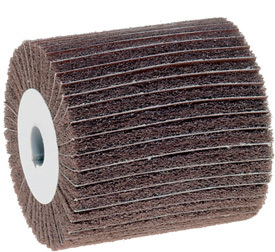 Interleave Flap Wheels - Alternating layers of abrasive cloth in various grits with maroon medium nonwoven finishing material. Used for light stock removal and deburring. Order with a 3/4" key mount or 5/8-11 tool arbor.